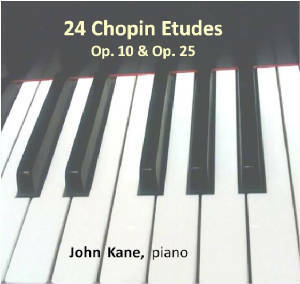 24 Chopin Etudes, the latest homemade recording of John Kane, was recorded in February, 2013. Full-length album is available on CD for $25 + S/H. Individual tracks listed below can also be purchased as MP3 downloads. Please click on track number below to hear a brief excerpt or click on "view video" to see a youtube clip of the selected track.